T-Mobile USA appears to be taking aim at its larger rivals on the 4G playground. The company has expanded its HSPA+ network in the Northeastern United States--and is now promoting the technology as providing "4G" speeds. By designating HSPA+ as a 4G technology, T-Mobile has caused some friction with its competitors, namely AT&T, which is also deploying HSPA+ throughout its network as a stepping stone to its 2011 deployment of LTE. T-Mobile said its HSPA+ network now covers more than 30 million Americans and it plans to cover 100 major metropolitan areas--185 million people--by year-end. In a press release, the company said HSPA+ supports theoretical peak download speeds of 21 Mbps but noted that typical downlink and uplink speeds will vary based on a number of factors, including location, device, and overall traffic on the local wireless network at a given time. "Our competitors are asking consumers to pay more for faster wireless service with limited coverage and very few capable devices," said Neville Ray, senior vice president of Engineering and Operations for T-Mobile, in a release. "In contrast, T-Mobile is already delivering 4G speeds today to customers and we continue to make major leaps in expanding our HSPA+ mobile broadband footprint." But AT&T is not happy with T-Mobile's designation of HSPA+ as a 4G technology. "I think that companies need to be careful that they're not misleading customers by labeling HSPA+ as a 4G technology," said AT&T Mobility (NYSE:T) spokesman Seth Bloom. AT&T plans to cover fully 250 million people by the end of this year with HSPA+, and it will begin rolling out LTE network technology next year. Bloom said AT&T will call its HSPA+ upgrade just that: HSPA+. "We aren't labeling those technologies as 4G," he said. However, he added that AT&T will refer to LTE as a 4G network. While there is no universally accepted definition of "4G," T-Mobile's use of 4G in reference to HSPA+ appears to be a competitive response to AT&T, as well as Sprint Nextel (NASDAQ:S) and Verizon Wireless (NYSE:VZ). Sprint is using Clearwire's (NASDAQ:CLWR) WiMAX network and marketing its mobile broadband services as Sprint 4G. Likewise, Verizon is building an LTE network that it is trumpeting as 4G. Unlike its competitors, T-Mobile has not said if, or when, it will upgrade its network from HSPA+ to LTE. Earlier this month the Financial Times reported that Deutsche Telekom was considering partnering with Harbinger Capital Partners to make its T-Mobile USA subsidiary a wholesale customer of Harbinger's proposed nationwide LTE network. 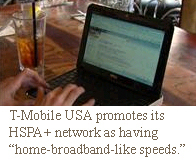 T-Mobile said the HSPA+ service is now available in the New York City metropolitan area, including New Jersey and Long Island, as well as Upstate New York (Albany, Buffalo, Rochester and Syracuse); Connecticut (Hartford, New Haven, Milford and Stamford); Providence, R.I.; Memphis, Tenn.; Las Vegas; Philadelphia and the Washington, D.C. suburbs. T-Mobile said the service will expand to Boston and Washington, D.C., in the coming weeks. The carrier said more than a dozen devices, including its myTouch 3G Slide and Garminfone smartphones, will be able to access its HSPA+ network. And what about the backhaul necessary to support the promised speeds of HSPA+? "T-Mobile currently has fiber backhaul capacity for a majority of our high-speed sites in these new locations to support these very fast speeds," wrote a T-Mobile spokeswoman in response to questions from FierceWireless. "Over the next few weeks, we'll continue to put the necessary backhaul in place in these locations to complete the upgrade. T-Mobile expects to have fiber backhaul in place in more than 100 metropolitan areas by the end of the year."